Inferior petrosal sinus sampling (IPSS) is an invasive procedure in which adrenocorticotropic hormone (ACTH) levels are sampled from the veins that drain the pituitary gland; these levels are then compared with the ACTH levels in the peripheral blood to determine whether a pituitary tumor (as opposed to an ectopic source of ACTH) is responsible for ACTH-dependent Cushing syndrome. 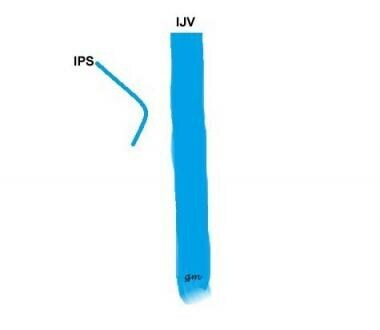 IPSS can also be used to establish on which side of the pituitary gland the tumor is located. Cushing disease results from excessive cortisol production due to elevated ACTH levels produced by a pituitary tumor. In contrast, Cushing syndrome includes all conditions of hypercortisolism due to either ACTH-dependent causes (eg, Cushing disease or ectopic ACTH secretion by a nonpituitary tumor) or ACTH-independent causes (eg, excessive autonomous secretion of cortisol from a hyperfunctioning adrenocortical tumor). Other and rarer conditions that can lead to Cushing syndrome include ectopic corticotrophin-releasing hormone (CRH) secretion, primary bilateral pigmented nodular adrenal hyperplasia, macronodular adrenal hyperplasia, ectopic actions of gastric inhibitory peptides, and other syndromes, such as McCune-Albright syndrome and Carney syndrome. Pseudo-Cushing states with similar clinical presentations may be found in depression and alcohol dependence. Cushingoid features may also be found in obesity. 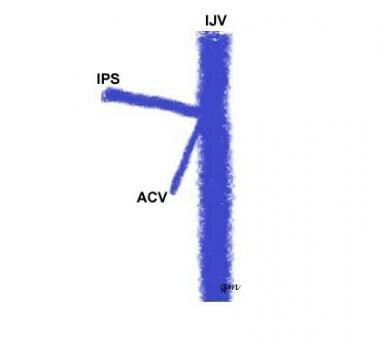 IPSS was introduced in 1977 by Corrigan et al, who reported the use of unilateral selective catheterization and venous sampling to localize ACTH secretion in a patient with a perplexing clinical and laboratory picture compatible with either ectopic ACTH secretion or pituitary-dependent Cushing syndrome. Later, it was established that the ACTH levels in the pituitary venous drainage may be asymmetric, owing either to the location of the corticotroph adenoma or asymmetric variations in venous anatomy. Some centers have reported improved accuracy and intrasellar localization with bilateral cavernous sinus sampling, [14, 15] but there is an increased risk of cranial nerve palsy,  so this technique has not yet gained popularity. Using samples drawn from IPSS, Oklu et al  have identified 3 small compound potential biomarkers of Cushing disease (pyridoxate, deoxycholic acid, and trimethyl adipate). These may elucidate tumor biology and suggest, in the future, possible diagnostic molecular imaging probes and therapeutic targets in patients with recurrent disease after surgery. In approximately 60% of individuals, pituitary venous drainage is symmetrical,  with most of the venous effluent from each side of the pituitary draining in to the ipsilateral IPS. As a result, in most people, BIPSS can be an effective tool to lateralize corticotroph adenomas and to avoid false-negative results. This procedure should be performed at a center with interventional radiologists who have skill and experience in performing BIPSS. False-positive results are rare. False-negative results (4%) are likely to be multifactorial owing to abnormalities in petrosal sinus anatomy, technical reasons, or intrinsic properties of the tumor ACTH secretion. According to Wind et al,  potential false-negative results are the most common type of diagnostic error with IPSS for the differential diagnosis of Cushing syndrome and can be identified by peak IPSS ACTH values of less than 400 pg/mL. Sharma and Nieman  have suggested that prolactin measurement during IPSS can improve diagnostic accuracy and decrease false-negative results. According to them, baseline prolactin inferior petrosal sinus–to-peripheral (IPS/P) ratio (ipsilateral to the dominant post-CRH ACTH IPS/P ratio) of 1.8 or more suggests successful catheterization during IPSS and prolactin-normalized ACTH IPS/P ratios can then be used to differentiate between a pituitary and ectopic source of ACTH. Values of 0.7 or lower are suggestive of ectopic ACTH syndrome and those 1.3 or higher are indicative of Cushing disease. However, they were unable to explain the implication of values between 0.7 and 1.3 and recommend further studies. IPS catheterization is technically demanding, and even experienced interventionists may fail in up to 15%-20% of cases. Adverse events such as pulmonary thromboembolism, [32, 33] venous subarachnoid hemorrhage,  pontomedullary junction stroke,  brainstem infarction,  transient sixth cranial nerve palsy,  and obstructive hydrocephalus  have been reported. 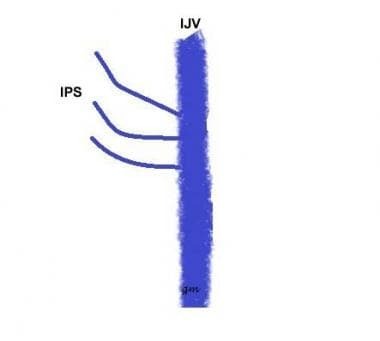 The incidence is related to the entry of microcatheter-wire systems into the sinus, where the catheter could engage and temporarily occlude small bridging veins that connect the transverse pontine, lateral medullary, and pontomedullary veins with the inferior petrosal vein, resulting in brainstem ischemia and hemorrhage. Injury to these veins could result in subarachnoid hemorrhage. Raff H. Cushing syndrome: update on testing. Endocrinol Metab Clin North Am. 2015 Mar. 44 (1):43-50. [Medline]. Bansal V, El Asmar N, Selman WR, Arafah BM. Pitfalls in the diagnosis and management of Cushing's syndrome. Neurosurg Focus. 2015 Feb. 38 (2):E4. [Medline]. Prabhu NK, Moorthy S, Sreekumar KP, Nair V, Kumar H, Pillai AK. Indian Journal of Radiology and Imaging. 2002. 12 (1):13—20. Newell-Price J, Trainer P, Besser M, Grossman A. The diagnosis and differential diagnosis of Cushing's syndrome and pseudo-Cushing's states. Endocr Rev. 1998 Oct. 19(5):647-72. [Medline]. Law M, Wang R, Liu CJ, Shiroishi MS, Carmichael JD, Mack WJ, et al. Value of pituitary gland MRI at 7 T in Cushing's disease and relationship to inferior petrosal sinus sampling: case report. J Neurosurg. 2018 Mar 23. 23:1-5. [Medline]. Raghuram K, Durgam A, Sartin S. Assessment of the Inferior Petrosal Sinus on T1-Weighted Contrast-Enhanced Magnetic Resonance Imaging. J Clin Imaging Sci. 2018. 8:22. [Medline]. [Full Text]. Corrigan DF, Schaaf M, Whaley RA, Czerwinski CL, Earll JM. Selective venous sampling to differentiate ectopic ACTH secretion from pituitary Cushing's syndrome. N Engl J Med. 1977 Apr 14. 296(15):861-2. [Medline]. Radvany MG, Quinones-Hinojosa A, Gallia GL, Wand GS, Salvatori R. VENOUS SAMPLING FOR CUSHING DISEASE: COMPARISON OF INTERNAL JUGULAR VEIN AND INFERIOR PETROSAL SINUS SAMPLING. Endocr Pract. 2016 Sep. 22 (9):1057-61. [Medline]. Shaikh ST, Karmarkar VS, Deopujari CE. Pediatric Cushing's Disease: Dichotomy in Lateralization between Imaging and Inferior Petrosal Sinus Sampling with Review of Literature. J Pediatr Neurosci. 2017 Oct-Dec. 12 (4):349-352. [Medline]. Kakade HR, Kasaliwal R, Jagtap VS, et al. Ectopic ACTH-Secreting Syndrome: A Single-Center Experience. Endocr Pract. 2013 Nov-Dec. 19(6):1007-14. [Medline]. Doppman JL, Oldfield E, Krudy AG, Chrousos GP, Schulte HM, Schaaf M. Petrosal sinus sampling for Cushing syndrome: anatomical and technical considerations. Work in progress. Radiology. 1984 Jan. 150(1):99-103. [Medline]. Oldfield EH, Doppman JL, Nieman LK, Chrousos GP, Miller DL, Katz DA. Petrosal sinus sampling with and without corticotropin-releasing hormone for the differential diagnosis of Cushing's syndrome. N Engl J Med. 1991 Sep 26. 325(13):897-905. [Medline]. Nieman LK, Cutler GB Jr, Oldfield EH, Loriaux DL, Chrousos GP. The ovine corticotropin-releasing hormone (CRH) stimulation test is superior to the human CRH stimulation test for the diagnosis of Cushing's disease. J Clin Endocrinol Metab. 1989 Jul. 69(1):165-9. [Medline]. Graham KE, Samuels MH, Nesbit GM, Cook DM, O'Neill OR, Barnwell SL. Cavernous sinus sampling is highly accurate in distinguishing Cushing's disease from the ectopic adrenocorticotropin syndrome and in predicting intrapituitary tumor location. J Clin Endocrinol Metab. 1999 May. 84(5):1602-10. [Medline]. Teramoto A, Nemoto S, Takakura K, Sasaki Y, Machida T. Selective venous sampling directly from cavernous sinus in Cushing's syndrome. J Clin Endocrinol Metab. 1993 Mar. 76(3):637-41. [Medline]. Lefournier V, Martinie M, Vasdev A, Bessou P, Passagia JG, Labat-Moleur F. Accuracy of bilateral inferior petrosal or cavernous sinuses sampling in predicting the lateralization of Cushing's disease pituitary microadenoma: influence of catheter position and anatomy of venous drainage. J Clin Endocrinol Metab. 2003 Jan. 88(1):196-203. [Medline]. Ilias I, Chang R, Pacak K, Oldfield EH, Wesley R, Doppman J. Jugular venous sampling: an alternative to petrosal sinus sampling for the diagnostic evaluation of adrenocorticotropic hormone-dependent Cushing's syndrome. J Clin Endocrinol Metab. 2004 Aug. 89(8):3795-800. [Medline]. Oklu R, Deipolyi AR, Wicky S, et al. Identification of small compound biomarkers of pituitary adenoma: a bilateral inferior petrosal sinus sampling study. 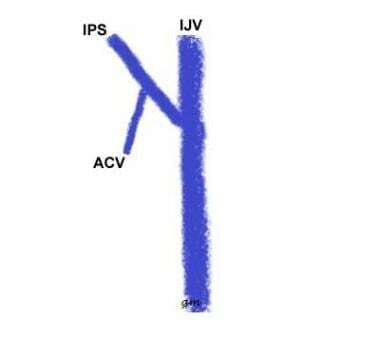 J Neurointerv Surg. 2013 Sep 4. [Medline]. Miller DL, Doppman JL. Petrosal sinus sampling: technique and rationale. Radiology. 1991 Jan. 178(1):37-47. [Medline]. Utz A, Biller BM. The role of bilateral inferior petrosal sinus sampling in the diagnosis of Cushing's syndrome. Arq Bras Endocrinol Metabol. 2007 Nov. 51(8):1329-38. [Medline]. Shiu PC, Hanafee WN, Wilson GH, Rand RW. 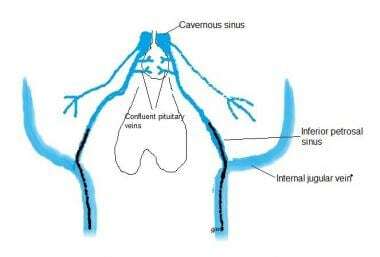 Cavernous sinus venography. Am J Roentgenol Radium Ther Nucl Med. 1968 Sep. 104(1):57-62. [Medline]. Mamelak A,Dowd C, Tyrell J, McDonald J, Wilson C. Venous angiography is needed to interpret inferior petrosal sinus and cavernous sinus sampling data for lateralising adrenocorticotropin-secreting adenomas. J. Clin. Endocrinol Metab 1996: 81: 475-81. Venous angiography is needed to interpret inferior petrosal sinus and cavernous sinus sampling data for lateralising adrenocorticotropin-secreting adenomas. J. Clin. Endocrinol Metab. 1996. 81:475-81. Doppman JL, Chang R, Oldfield EH, Chrousos G, Stratakis CA, Nieman LK. The hypoplastic inferior petrosal sinus. A potential source of false negative results in petrosal sampling for Cushing’s disease. J. Clin Endocrinol Metab. 1999. 84:53-40. Bonelli FS, Huston J 3rd, Carpenter PC, Erickson D, Young WF Jr, Meyer FB. Adrenocorticotropic hormone-dependent Cushing's syndrome: sensitivity and specificity of inferior petrosal sinus sampling. AJNR Am J Neuroradiol. 2000 Apr. 21(4):690-6. [Medline]. Booth GL, Redelmeier DA, Grosman H, Kovacs K, Smyth HS, Ezzat S. Improved diagnostic accuracy of inferior petrosal sinus sampling over imaging for localizing pituitary pathology in patients with Cushing's disease. J Clin Endocrinol Metab. 1998 Jul. 83(7):2291-5. [Medline]. Wind JJ, Lonser RR, Nieman LK, DeVroom HL, Chang R, Oldfield EH. The lateralization accuracy of inferior petrosal sinus sampling in 501 patients with Cushing's disease. J Clin Endocrinol Metab. 2013 Jun. 98(6):2285-93. [Medline]. [Full Text]. Sharma ST, Nieman LK. Is Prolactin Measurement of Value during Inferior Petrosal Sinus Sampling in Patients with ACTH-dependent Cushing's Syndrome?. J Endocrinol Invest. 2013 Jul 26. [Medline]. Jarial KDS, Bhansali A, Gupta V, Singh P, Mukherjee KK, Sharma A, et al. Diagnostic accuracy and comparison of BIPSS in response to lysine vasopressin and hCRH. Endocr Connect. 2018 Mar. 7 (3):425-432. [Medline]. Kotwal N, Kumar Y, Upreti V, Singh A, Garg MK. Bilateral inferior petrosal sinus sampling using vasopressin. Indian J Endocrinol Metab. 2016 May-Jun. 20 (3):399-403. [Medline]. Feng M, Liu Z, Liu X, Zhang X, Bao X, Yao Y, et al. Tumour lateralization in Cushing's disease by inferior petrosal sinus sampling with desmopressin. Clin Endocrinol (Oxf). 2018 Feb. 88 (2):251-257. [Medline]. Zampetti B, Grossrubatscher E, Dalino Ciaramella P, Boccardi E, Loli P. Bilateral inferior petrosal sinus sampling. Endocr Connect. 2016 Jul. 5 (4):R12-25. [Medline]. Diez JJ, Iglesias P. Pulmonary thromboembolism after inferior petrosal sinus sampling in Cushing's syndrome. Clin Endocrinol (Oxf). 1997 Jun. 46(6):777. [Medline]. Obuobie K, Davies JS, Ogunko A, Scanlon MF. Venous thrombo-embolism following inferior petrosal sinus sampling in Cushing's disease. J Endocrinol Invest. 2000 Sep. 23(8):542-4. [Medline]. Sturrock ND, Jeffcoate WJ. A neurological complication of inferior petrosal sinus sampling during investigation for Cushing's disease: a case report. J Neurol Neurosurg Psychiatry. 1997 May. 62(5):527-8. [Medline]. Lefournier V, Gatta B, Martinie M, Vasdev A, Tabarin A, Bessou P. One transient neurological complication (sixth nerve palsy) in 166 consecutive inferior petrosal sinus samplings for the etiological diagnosis of Cushing's syndrome. J Clin Endocrinol Metab. 1999 Sep. 84(9):3401-2. [Medline]. Bonelli FS, Huston J 3rd, Meyer FB, Carpenter PC. Venous subarachnoid hemorrhage after inferior petrosal sinus sampling for adrenocorticotropic hormone. AJNR Am J Neuroradiol. 1999 Feb. 20(2):306-7. [Medline]. Gandhi CD, Meyer SA, Patel AB, Johnson DM, Post KD. Neurologic complications of inferior petrosal sinus sampling. AJNR Am J Neuroradiol. 2008 Apr. 29(4):760-5. [Medline]. Miller DL, Doppman JL, Peterman SB, Nieman LK, Oldfield EH, Chang R. Neurologic complications of petrosal sinus sampling. Radiology. 1992 Oct. 185(1):143-7. [Medline]. Oldfield EH, Doppman JL. Petrosal versus cavernous sinus sampling. J Neurosurg. 1998 Nov. 89(5):890-3. [Medline]. Seyer H, Honegger J, Schott W, Küchle M, Huk WJ, Fahlbusch R. Raymond's syndrome following petrosal sinus sampling. Acta Neurochir (Wien). 1994. 131(1-2):157-9. [Medline]. Sheth SA, Mian MK, Neal J, et al. Transsphenoidal surgery for cushing disease after nondiagnostic inferior petrosal sinus sampling. Neurosurgery. 2012 Jul. 71(1):14-22. [Medline]. The authors thank Dr. J. Modhe, Chief, Department of Radiology, PD Hinduja Hospital, Mahim, for reviewing this article.